I was raving about the genius of that sauce all the way home and fully intended to make it straightaway. That was ten years ago. I never made it because who wants to spend 30 bucks on melted candy bars? Well I was getting ready for a fondue party with some girlfriends last week when it hit me: a deconstructed candy bar looks a lot like stuff I can make myself! let's see, there's caramel sauce. I've got Ashley's recipe for that. Marshmallow cream, check. And chocolate of course. So easy and yet so elusive. It may have been ten years, but my taste buds don't forget a taste. This recipe is spot on. Sorry shifty caterer. I cracked your recipe-you never were melting down expensive chocolate bars were you? Prepare 1 recipe of Ashley's Caramel Sauce. Use a high quality chocolate. Melt all ingredients on med heat in a small saucepan. Continue to heat for about 3-5 min or until the sauce will drizzle. 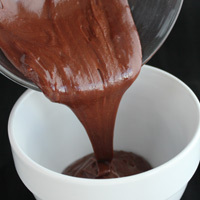 Note: The better the chocolate, the better your sauce will turn out. If you want to spend a little more, 12 oz. of a semi or dark chocolate bar such as Lindt would work really well. There is so much sugar in the recipe already that I wouldn't recommend using milk chocolate. 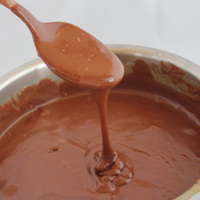 As the sauce cools it will thicken quite a bit, so if you are using it for fondue or ice cream, serve immediately. When cool it is thick enough to use as frosting. Versatile, right? Enjoy! 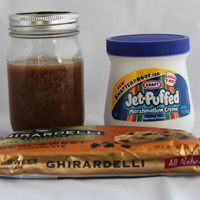 Problems: Make sure to use the full recipe of caramel, or the marshmallow will remain gooey. 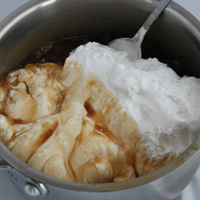 Prepare 1 recipe of Ashley's Caramel Sauce. Use a high quality chocolate. Melt all ingredients on med heat in a small saucepan. Continue to heat for about 3-5 min or until the sauce will drizzle. 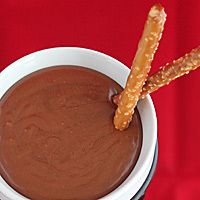 As the sauce cools it will thicken quite a bit, so if you are using it for fondue or ice cream, serve immediately. When cool it is thick enough to use as frosting. Versatile, right? Note: Tips for Frosting: This frosting is not stiff enough to pipe. It will spread on a sheetcake or make a rustic cupcake look, but it is not meant as a decorators frosting. You may need to stir in milk 1T at a time to help it spread.